In September 2010 we warned of the Chinese Wall of Steroids, http://stage.blacksummitfg.com/wp-content/uploads/2011/01/The-Great-Wall-of-Steroids-Vol-2-Issue-3.pdf . In that newsletter we also explained the dangers of WMPs (wealth management products) in China where investors are promised unreal returns. China’s credit binge is getting out of control and we would not be surprised if financial quakes worse than the ones experienced in the last ten months start to materialize over the next several quarters. 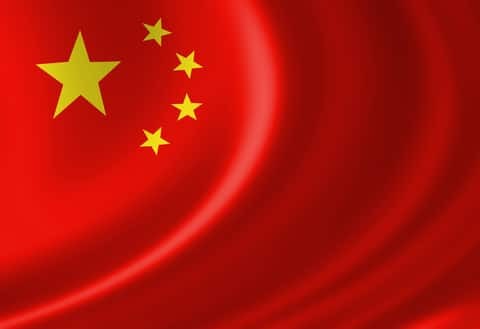 The fact that Chinese authorities and financial institutions need to keep feeding their system with more and more credit facilities in order to generate a dollar of GDP undermines financial stability in several countries. The Chinese boom generated by credit overextension following the 2008 crisis will inevitably lead to a bust. When 20% of major firms pay more in interest than the profits they generate, then we know that we are headed into lulu land where non-performing loans will create zombie banks which in turn will eat corporations, entities and possibly families themselves. No wonder then that all of them would like to send their money abroad, as reported by the Bank of International Settlements (BIS) and shown below. 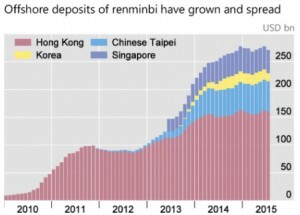 When we take into account the fact that Chinese banks’ assets represent 40% of global GDP, then we can understand the implications of Chinese capital outflows. If they keep growing, then the whole Chinese banking system will shake and global assets will take a turn for the worse, implying credit freezes, widening spreads, and panic which will in turn destabilize confidence, spending, employment, and growth. Chinese stocks and bonds combined are valued close to $15 trillion, a number that cannot be supported even if deleveraging is pursued aggressively in China. The sad fact that the only game in town is the propping up of the stock market and the proliferation of bubbles, makes us wonder if the bursting is closer than when we think it might happen. “Shadow assets” are growing at a rate of more than 30% annually which is unsustainable. In reality those “assets” will convert to bad loans since they have nothing to do with investments (the latter term is a euphemism to avoid capital requirements). These dark pools of bank liabilities have the potential of undermining banks’ liquidity, and if the latter starts suffering then it might be time to call the game off. Unless China allows several of those insolvent corporations go bankrupt, slow down dramatically the credit binge and preserve funds for the coming rainy days by following a strategy of restraint and conservation, the whole world may be facing calamities which even if are foreseen political considerations prevail and thus stability is threaten.